"This is a deliciously dangerous concoction that I discovered while I was a waitress. It's a sweet and smooth dessert in a glass!" In a cocktail shaker full of ice, combine the whiskey, amaretto, pineapple juice, grenadine, and lemon-lime soda. Shake vigorously and strain into a martini glass. Serve with a maraschino cherry. See how to make an espresso martini with vodka and Kahlua. Good, but I think it would be even better with rum. I made no changes. I like this a bunch! I used a little more Sprite because I'm 'light weight' but the taste is so terrific. 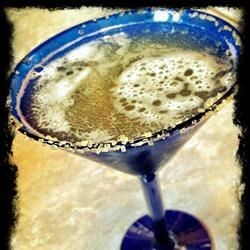 Like a candy instead of the swill my husband likes in a traditional martini, hahah! Very good. But also very sweet. I had mine over ice, and it was better. Actually it was EXCELLENT over ice. My new go to drink!